Each year, more than 625 children in Australia, and 175,000 children worldwide are diagnosed with cancer. Although many children with cancer can be cured (i.e., survival rates are over 8 in 10 children), it is still devastating to hear that your child has cancer. Below are some suggestions for coping with the difficult and often distressing event of a child being diagnosed with this disease. Talking to others can be helpful for all involved. Breaking down what is happening to you can assist you to better cope and process the situation. Understanding what symptoms are likely to arise may help you in transitioning through them. It can take away the shock of change and allow you to feel more comfortable within yourself throughout this journey. Trying to keep on top of a healthy lifestyle can help your body fight the disease and make you feel more comfortable in yourself throughout the process. It can keep your energy levels up, help with sleeping and manage stress and fatigue. For everyone in the family, it can be helpful to keep things as close to normal within your life as possible. Of course you need to be aware that some things will need to change and it is important to be flexible with that. Take one day at a time. As carers, you may need your own support system as well. Talking to someone not directly involved can help relieve some of the stress and pressure, remembering to take care of yourself as well as people you are caring for. Things can be overwhelming for everyone in the family and sometimes it can be the little things that cause the most stress. Being offered help can significantly reduce the amount of stress placed on the family and give you the opportunity to cope properly with the changes in your lives. Thank you for taking the time to read this. We hope you have gained some insight into helping yourself and your family during this difficult time. 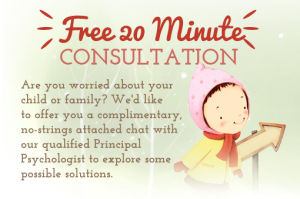 As a gesture of our gratitude, we would like to offer you a complimentary chat with our Principal Psychologist, to assist you in exploring some more options in coping and management.